The Chairman is the debut novel by author CD Barros. This is a story of passion, innocence, greed, corruption and power. We go along with our main protagonist, Livio Almeida, as he is forced to mature quickly and abandon many of the qualities which make for a sweet child in order to survive the decadent world of top tier European Football management. 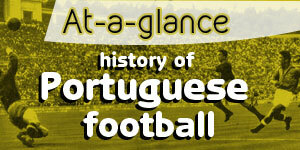 PortuGOAL has five free copies of this e-book up for grabs. Read the full review of an innovative novel and a ripping good read, and enter the competition to win it. We begin in a small village in Northern Portugal where a doting mother does her best to protect her child and educate him. His father, Casimiro, is the one who introduces the wide-eyed child to the world of football and right from the first time he saw a live game, Livio is smitten. Although it is the father who opens the door to this new world for his son, it is Adriana Almeida, Livio’s progressive mother, who paves the way for who her son will truly become. Right from the start there is a constant battle within Livio. A theme that plays out right to the end of the book. Who he wants to be and who he needs to be. It is an interesting dichotomy and one which leaves you asking questions throughout. The time period is that of post-war Salazar, when the Portuguese people went through a time of change and reflection. Many chose to immigrate to places like America, Canada and Australia while others held on and in typical European fashion, stubbornly rode it out. I have never read any book which covered this period and the author handles it all with precision and the utmost respect. The Portuguese people are not portrayed as quasi-Italians or Spaniards with a slightly different language; the people are portrayed accurately. When you read a story as unique and layered as this one is, you would assume that this is more than just extensive research, this is a deeply personal subject for the author. Dina Nayeri, another of my favourite authors, is the only other author I have read who was able to transport me to an exotic and alien place. What Dina Nayeri did for Iranians, CD Barros does in equal terms for the Portuguese. The story is split into two parts. The beginning, is a bird’s eye view of the young Livio dealing with life in his small town and the individual moments which shape his destiny. We are taken by the hand and paraded through this marvelous world but the reader is always secure as he is being lead, safe in the knowledge the parents and friends he meets along the way have nothing but the best intentions for him. Part two however, is an all-out brawl as Livio literally and figuratively fights for every centimetre of ground as he claws his way to the top. The point of view also changes to that of the more personal first person. Changing perspectives mid book is not unheard of but it is a tough task and one which honestly works here. We need the deeper touch of the first person to truly experience the changing world Livio now resides in as an adult and to see his innermost thoughts. Never was I left sighing or rolling my eyes at this. The change made sense and it was done organically. Without giving away any spoilers, the second half is where things also get hairy for our boy Livio. Betrayal, love, shower scenes, brawls and brutal efficiency all occur. The world of eduction and innocence is replaced by the world we never see. How do the top clubs stay on top year after year? Luck? Or something more primal and sinister. These issues are all addressed in the second half. Anyone who loves the management side of European football or just enjoys a ripping tale that takes place in a world you have never seen before will enjoy this story. The novel is written very well and the balance of dialogue to descriptions handled expertly. Like many others, I like to consider myself well read but this book surprised me. Surprised me in that cool way books have a tendency to do when you don’t expect it. The last time I was this engaged while reading was Ready Player One by Ernest Kline, that book hit all my geeky bones. The Chairman combined two of my passions into one intelligent and twisty package, fiction and football. There is something in this novel for anyone who loves either of those. If I could describe CD Barros’ voice, it would be to say he writes with a contemporary hand but has the soul of a village elder. The descriptions, as mentioned, are vibrant and alive without praising or demeaning the subject. The dialogue is arousing and sprinkled with small tidbits of knowledge about the world around us. Never does he preach or tell us what to think. Only the facts are presented and we are along for the ride. It was a pleasure to read this book and difficult to write a review because there really isn’t another novel out there like this. If you are looking for something different, give The Chairman a try. A fantastic debut. 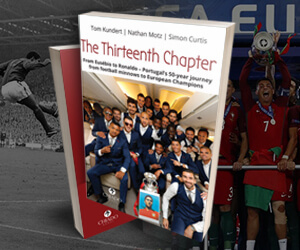 To be in with a chance of winning a copy of the book simply answer the following question: Of Portugal's Big Three, which club has the newest Chairman (presidente)? The Chairman is available for purchase at Amazon. Update: Congratulations to the five winners drawn out of the hat: Ricardo Nogueira, Julia Doucette, Sergio Pereira, Herman Pontes and Georgina Dimopoulos. Thank you to everybody who entered. 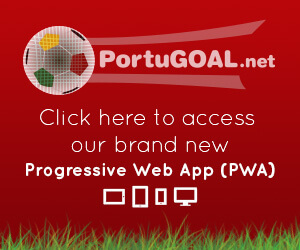 Keep track of PortuGOAL's "Book Corner" section for more books and more competitions in the coming weeks.